FILE - Secretary of Commerce Wilbur Ross attends the Forbes Global CEO Conference in Hong Kong, Sept. 26, 2017. Forbes estimated Ross to be worth $2.9 billion in its 2016 list of the 400 richest people in the U.S. The magazine says it decided to remove Ross from the list after financial disclosure forms filed after his Cabinet nomination showed less than $700 million in assets. Forbes says Ross protested, claiming that he had transferred more than $2 billion to family trusts between the 2016 election and President Donald Trump's inauguration. But when that claim raised ethics and tax questions, the Department of Commerce issued a statement saying there was no such transfer. President Donald Trump convened his Cabinet for a kickoff meeting with new Chief of Staff John Kelly. As for the escalating tensions with North Korea, Trump said the situation "will be handled." He did not give specifics. "We handle everything," Trump said. Forbes says it is now "confident that the money never existed. It seems clear that Ross lied to us." 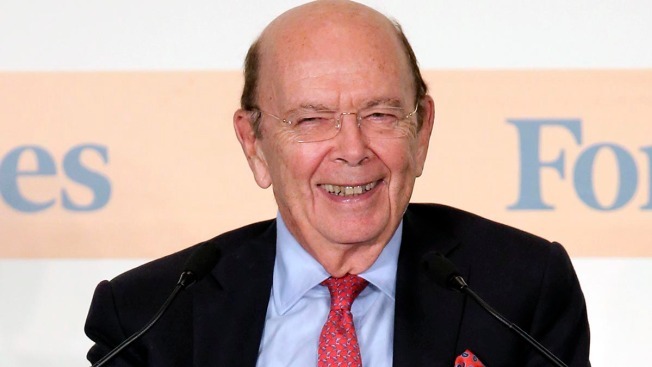 Ross, the Trump administration's point man on trade and manufacturing policy, is also facing questions over leaked documents showing that he has a stake in a company that does business with a gas producer partly owned by the son-in-law of Russian President Vladimir Putin. Ross told Britain's Sky network that he disclosed his investment in Navigator Holdings, a shipping giant that counts Russian gas and petrochemical producer Sibur among its major customers. The commerce secretary says U.S. ethics officials who reviewed his finances did not ask him to sell his Navigator stock.